At the end of Day 2 of Brazil Masters, complete quarter-finals would be revealed. Unfortuantely no wildcard made to quarter-finals today. World Rankings of Stephen Hendry dropped out of Top 16 for the first time in 23 years due to his struggle in recent seasons and his first round defeat in Shanghai Masters last week. Hendry won 4-1 his first round match in Brazil against Brazilian wildcard Noel Rodrigues. Rodrigues took the opening frame with 44 but he did not win any more frame afterwards. Hendry took four frames in a row to victory 4-1 with 60, 54 and missed maximum in the last frame. Hendry attempted 147 in the fifth frame but only finished on the 15th red. The cueball ran out of position when he was trying pot the 15th black. He cut it too thin and the break ended at 113. 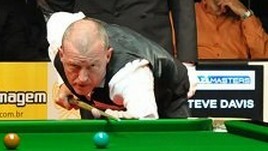 Hendry missed the chance to share the record with Ronnie O'Sullivan, who made his eleventh 147 on PTC4 last month. 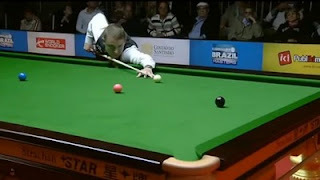 Ali Carter saw off Legend Steve Davis 4-2 with 70 and 65. It is a shame that we are not able to see a match between Hendry and Davis in the quarter-finals but Hendry v Carter is still a good match. Shaun Murphy whitwashed Sobradinho de Dues with breaks of 81, 72 and 49. 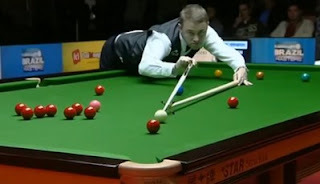 Ricky Walden set up a clash with Murphy as he moved to quarter-finals by beating Gould 4-1 with 52 and 51.